Here you can find bird necklaces that you would love to add in your jewelry collection. Find the most adorable and stylish bird necklaces on this page. They make a very good gift for women in all ages and goes well with different outfit styles. There are fancy and extravagant bird jewelry out there and also simple and classy necklaces for everyday wear. This article is going to make finding the bird necklace you have always been looking for so much easier. Just scroll down and you can find sparrow necklaces, penguin necklaces and other pretty jewelry. They are mostly made of materials like sterling silver, yellow or white gold, stainless steel and other. Some of them decorated with diamonds and cause we women love the "bling bling"
How do you feel about bird necklaces? I'm looking for one at the moment! They are nice, but not my cup of tea. 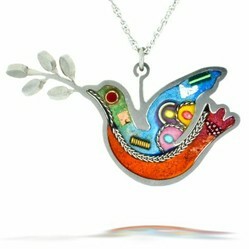 I absolutely love colorful bird necklaces and pendants. They are fun and look so unique at the same time. My big favorites are swan necklaces. They are incredibly elegant and so beautiful that it breaks my heart i can't buy them all. Swan necklaces are usually decorated with diamonds or crystals. There are so many to select from. Would you love to buy one with ruby, opal, amethyst, topaz, green jade or something else? Also there are very adorable hummingbird jewelry i strongly recommend to check out. If you are looking for something more cute and playful, then maybe you would like to check out penguin necklaces. Doesn't matter how old you are, they look gorgeous on everyone. Most expensive and stylish penguin necklaces are usually crafted of white gold and detailed with white and black diamonds. But if you want to gift penguin necklace to a little girl who doesn't actually need expensive jewelry, then there are penguin jewelry made of cheaper materials, but they still look very cute and would bring a smile to everyone's face. 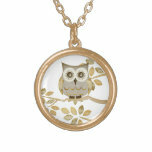 Owl and Dove Necklaces are very fashionable and probably one of the most popular bird necklaces out there. Dove necklaces are absolutely timeless. Probably they look amazing even after 10 years from now. They look the best when they are crafted of sterling silver or white gold. Dove is the symbolises peace, which is probably one of the reasons why people love dove necklaces so much. 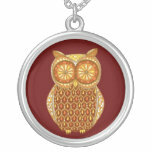 Owl necklaces are very trendy right now. Available in many different sizes and styles. You can find them made of materials like silver, gold, brass, copper, wood, perch bone and other. Some of them are even decorated with real feathers. Owl is also known as a symbol of wisdom. Simple, elegant and perfect everyday necklace. 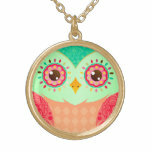 Trendy and beautiful owl necklaces you have been looking for! Beautiful designs here! They are lovely.